Zombie Survivor: Will you survive the zombie outbreak and save the civilians? 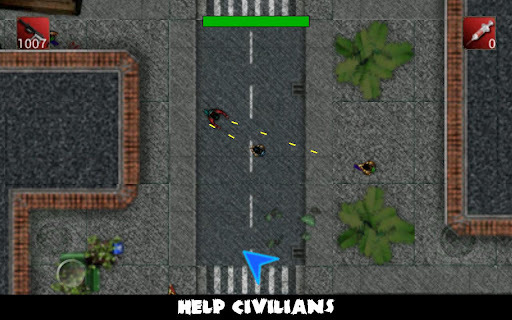 Rating: 3.5/5 Zombie Survivor is a great free game which has good stylisation. It might not be much of a looker but you’ll definitely enjoy it if you’re an old school gamer. I only wish there were more levels! Zombie Survivor: Will you survive the zombie outbreak and save the civilians? Google Play’s five days of game discounts really threw us. In fact, their random acts of generosity always confuse us because we feel that if people purchased all the games that were available then surely they wouldn’t be interested in any new game for another 6 months. Oh well, one big hit discount that really had us hooked was Rebuild. 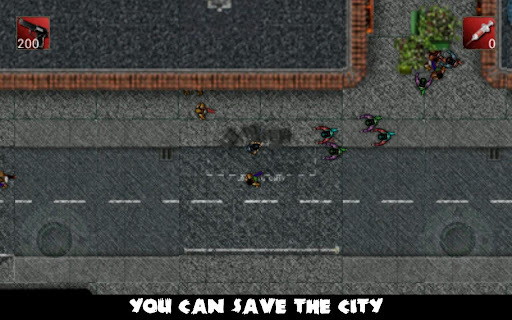 This is a post apocalyptic strategy game which is like SimCity/Civilization based on zombies. It’s all turn based and the zombie horror intensity is created from the game text, music and still images. Somehow Rebuild manages to play with your mind and create the feeling of zombie fear without actually using any animated undead! However, you would eventually twig that there isn’t any action and to solve that doomsday desire you can kill some live zombies in Zombie Survivor. Gameplay: Zombie Survivor is a bit like old school GTA1 crossed with a Gun Bros style shooting game. You’ve got a bird’s eye view of your hero and you’ll run him around the city scavenging for guns which you’ll then use to exterminate the dead. In true infested human style you have to try and clear out the undead before they infect the general population and spread the virus! Two game modes exist here: an extermination or an evacuation type game. In both modes you’ll actually do well to hunt down the zombies as quickly as possible so they don’t infect the survivors. But in the evacuation game there’s the added complexity of dragging the survivors to the helipad as well. There’s a survivor tracker in both game modes and you’ll only pass the level if enough people are saved. Perhaps the game sounds quite simple at the moment – especially when you think of it as a gun bros shoot’em up, but there’s a level of complexity introduced via an energy management system. This means you can’t run around at top speed all the time because you have limited stamina so occasionally you’ll need to slow down to catch your breath. This element of realism combined with the eerie lonely fear factor makes this game very exciting! Personally, I find the infecting aspect very interesting. If a zombie infection manages to get into the general public then it can spread like wildfire! It’s quite an interesting scenario where you need to try and filter out the infected whilst also trying to hunt the remaining zombies. My solution was to just find the zombies and clear them out as quickly as possible before they had the chance of biting new victims. Good stuff: This is a surprisingly entertaining game. The loneliness in parts of the city induces an eerie feel and even the slightly imperfect map objects add to the game style. The onscreen dual stick controls are pretty good and so you can focus on strafe firing the infected. The zombies themselves aren’t the Romero style slow zombies but are instead the Zack Snyder fast running style undead. In fact they’ll accelerate on people when they’re hunting their food and the result is a high paced action game. Though there are a few niggling issues here or there I actually feel that some of the problems add to the realism. For instance people can hide under buildings and sometimes its not possible to see infected nor the zombies. Although it can make the game extremely difficult, it also adds to the intensity of the game! The only major drawback is that I wish there were more levels. Unfortunately there are only 10 levels and once you’ve completed them then you have to entertain yourself by making your own levels. 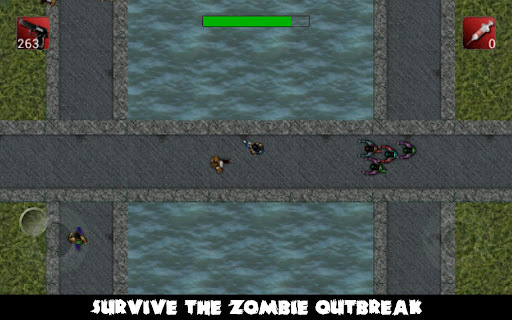 Rating: 3.5/5 Zombie Survivor is a great free game which has good stylisation. It might not be much of a looker but you’ll definitely enjoy it if you’re an old school gamer. I only wish there were more levels! The trick to the survivor levels is to learn the map and the location of the zombies. Once you know the map then you’ll know where to run to equip yourself with a weapon, and you’ll also know which order to run through the zones in order to clear out the undead. You will need to run straight to specific points to complete the levels successfully. If you’re too slow then the zombies will have more time to spread their infection. Once people are infected then they’ll walk slower and they’ll be a blue-purple colour. When you see this you need to give them an antidote shot (which is rarely around) or you need to wait for them to turn so that you can gun them down. Don’t leave them expecting to hunt them later because otherwise they’ll just spread the virus making it harder for you. My personal solution to infections is to try and get the zombies before this scenario even happens! If you nip the problem in the bud then the levels are much faster and more fluid. You need to clear out sections of zombies and trust on your speed of killing in order to exterminate the infection. If the infection is out of hand and you’re running back into safe zones to re-kill zombies then you’ll probably need to restart the level.